Looking for a stable and cost-effective active archive solution? Not all data is equal. Old inaccessible data is best retained on cheaper storage media while data that is frequently accessed is best served from a high-performance media. In order to deal with this problem, there are two primary techniques: storage tiering and data archiving. In the first case of storage tiering, all the data is written to a single storage repository and the data is tiered between storage technologies and cost efficiencies based on its age. The primary issue with this technique is that the data is limited to the storage appliance. In the second case of data archiving, an external application moves data from primary storage appliance to secondary storage appliance. The file is replaced with a link. This creates challenges in applications integration as it requires multiple parties, the application, the archiving software, the storage solutions etc, to agree on the behavior in link access. For example, how do you treat a link in a snapshot where a new version is created? This use case is relevant mainly for workloads that produce a lot of data on premises, usually on a fast and expensive storage, while a large portion of it will never be used. Using NooBaa, the application always communicates with the same file identifiers. Based on lifecycle policies, data is moved to secondary storage or the cloud. When data is moved to the cloud, data can seamlessly be accessed, even though it is out of the primary site. NooBaa can mirror all or part of the data constantly to another location (private/public cloud or a local repository). With NooBaa's personalized data flow, a scheduled tiering policy can remove the local copies based on LRU (Least Recently Used), creation date, metadata tags and much more. If needed, multiple tiering policies can take place and meet every enterprise needs, with a very little effort. Fully compatible with Rubrik, NetBackup, CloudBerry and any other product that can use S3 compatible storage. 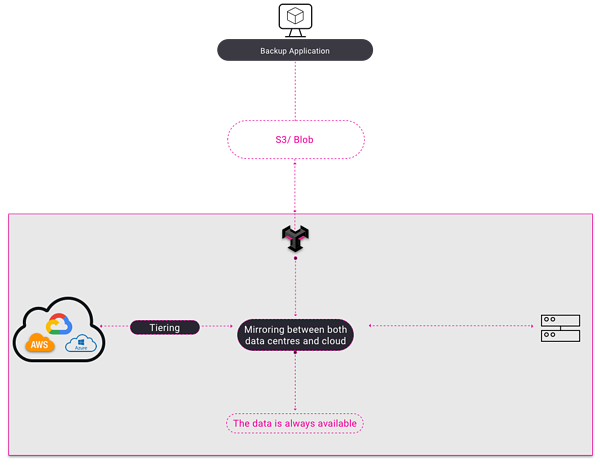 In this case, the data will be stored on NooBaa, while a lifecycle policy or a custom data flow function will move the local copies to the cloud. The data will be available regardless of the actual location, and NooBaa will serve it, with a locality preference. In many cases, the local storage is fast and expensive. Scaling this storage is usually very expensive and in some cases requires full migration from an aging system to a new one. With an active archive, your company can keep the local storage lean and fast, while keeping the cold data on a cheaper and scalable storage without any awareness of the applications. How can I test NooBaa's solution for active archiving?